Ok, it's confession time . . . I have two confessions. One, as hard as this may be to believe, I am not a HUGE fan of Basic Grey papers. I have a bunch of them but don't use them. And it's not because I hoard paper (which I do), but because they just don't speak to me, kwim? This was true until I saw their recent "Mellow" line. I love, LOVE this paper. Now, confession #2 . . . I also hoard cards I make, and I like the card I made tonight so much I probably won't send it to the couple I made it for because I can't bear to part with it. So, I started tonight needing to make an anniversary card to send and I still do . . . The card is pretty self explanatory . . . 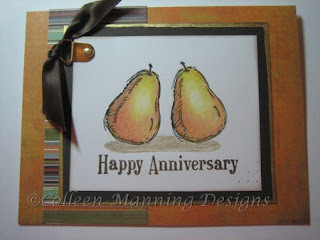 The pears are a SU stamp stamped twice, masked and the oval stamped. The pears were colored with my Prismacolor pencils and blender pencil. (I think I'm really getting the hang of this.) I added touches of glitter with my gold Copic Spica pen. 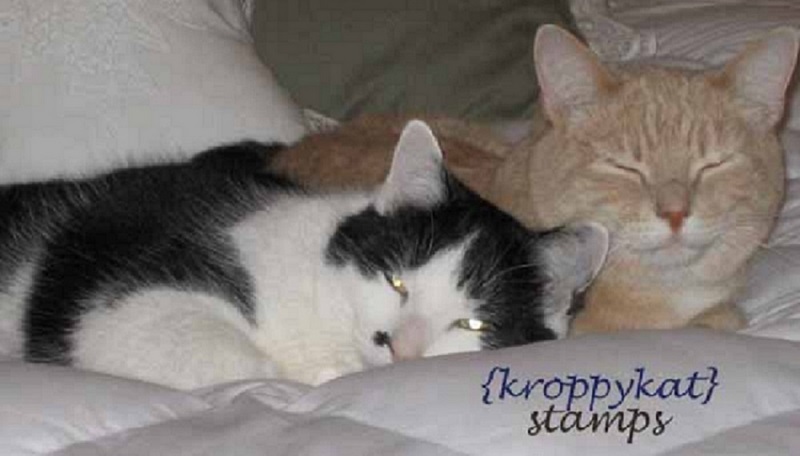 The sentiment is a clear Hampton Arts stamp. I matted the image piece on Bazzill dark brown and edged it lightly with gold leaf pen for added dimension and then placed it on the 2 pieces (background and strip) of "Mellow" after adding the ribbon and piercing. The inside reads "to the Perfect "Pair". I may have another card tonight, because I doubt I'll have time to post tomorrow. It's another card I don't think will see postage anytime soon . . . Did I mention I love Basic Grey's "Mellow" line? You are soooooooo silly, girl! Anyway, beautiful card! I think I'd hoard it too!